In 1847, Chief Factors James Douglas and Peter Skene Ogden asked Alexander Caulfield Anderson, then Chief Trader in charge at Fort Alexandria, to make his second exploration between Kamloops and Fort Langley — this time via the banks of the Fraser River. On May 19, Anderson left Kamloops and traveled on horseback through the Nicola Valley, to the mouth of the Nicola River. 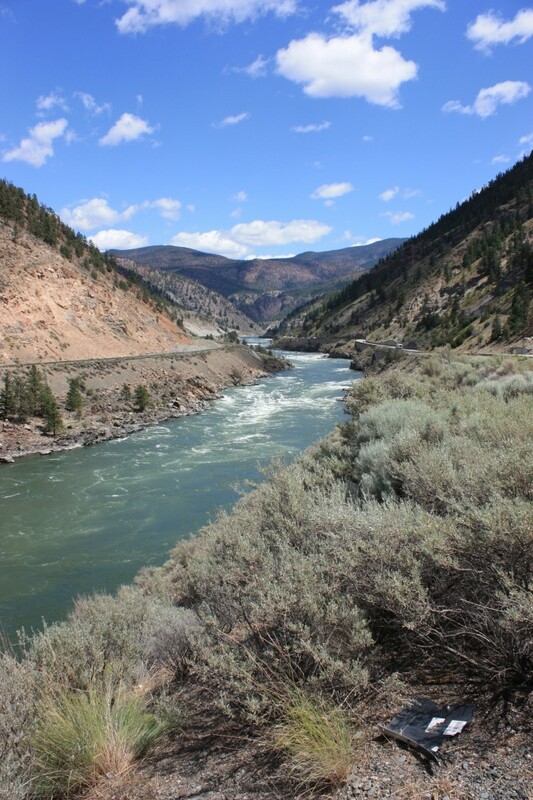 Where that river flowed into the Thompson, they sent the horses back to Kamloops and walked down the south bank of the rapid-filled Thompson River, toward the Fraser. Where the Nicoamen River tumbled down the cliff faces to the Thompson from the south, Anderson met his Native guide, Pahallak, who led him west toward the Fraser. From the junction of the two rivers, Anderson’s party walked south along the east bank of the Fraser, passing by a number of Native villages as they made their way. When the explorers set up camp that night on the rocky shores of the Fraser, all were exhausted by their long hike over the hot, dry hills. Anderson estimated they had covered 28 miles of rough ground, and it was ninety degrees in the shade. At every village the fur traders’ presence was announced by the high-pitched barks and howls of the woolly-coated and bushy-tailed dogs that lived up and down the Fraser River and all through the Thompson River district. These were Salish wool dogs, and these dogs were shorn like sheep and their wool used to weave the fine blankets for which these Native tribes were celebrated. Simon Fraser had reported seeing these animals years earlier, and Alexander Mackenzie had mentioned them. Now it was Anderson’s turn to comment on these historic and now extinct dogs that appeared to him as ghostly and mysterious animals that gamboled around each village — some shorn while others sweltered under a crop of flowing fleece that shone white in the sunlight. It was only when the explorers approached the villages that they could identify these animals as dogs. In his 1855 essay, “Notes on the Indian Tribes of British North America, and the Northwest Coast,” Anderson wrote about these dogs. The dogs in question are of a breed peculiar to the lower parts of Frazer’s River, and the southern portion of Vancouver’s Island and the Gulf of Georgia. White, with a long woolly hair and bushy tail, they differ materially in aspect from the common Indian cur; possessing, however, the same vulpine cast of countenance. Shorn regularly as the crop of hair matures, these creatures are of real value to their owners, yielding them the material whence blankets, coarse it is true, but of excellent fabric, are manufactured. My habits of life since early manhood, have possibly tended in some degree to blunt the power of appreciation in these matters, but I confess I could not witness without satisfaction, the primitive approach to textile manufactures which here first recurred to my view after the lapse of many years. An additional interest was afterwards created in my mind, when on examination, I found the implement used for weaving, differed in no apparent respect from the rude loom of the days of the Pharaohs, as figured by modern archaists. The word “vulpine” in this quote means fox-like. Since first writing this post, I found in Anderson’s writing a description of some of the ways that the natives used this dogs’ wool. These two quotes come from a collection of scraps from Anderson’s writing, hidden away in the B.C. Archives. To the westward of the Coast range & especially as the sea was approached other articles were utilized for clothing, such as the hair of the mountain goat, the hair of a certain breed of dog which was bred for the purpose (now I believe extinct), the fibre of cedar bark, the latter sometimes mixed with hair or strips of fur, were spun & woven into blankets & articles of clothing. I expect he wrote this in the 1870’s, and is speaking of the Natives along the coast at Bella Bella and elsewhere. Certainly this was written well after 1858. Clothing. Inasmuch as the natives of the coast were mostly canoe or fishing Indians, moccasins were not so much in use & the use of trousers or leggings were also dispensed with, a waist cloth being substituted by the men & the women wearing a skirt made by twisting dog hair into a deep fringe several yards long, which went round their waists several times & hung down to the ankles. This way of dressing was more convenient for wading in water & getting in & out of canoes…. These dogs no longer exist. They disappeared immediately after Forts Yale and Hope were built because the Natives on this part of the lower Fraser no longer had any need to weave their own blankets. But in some places the traditions lasted longer. The Cowichans, for example, had no access to the fur traders’ blankets and kept their Native craft going. Eventually they substituted wool for dogs’ hair, and knitted sweaters rather than weaving blankets. 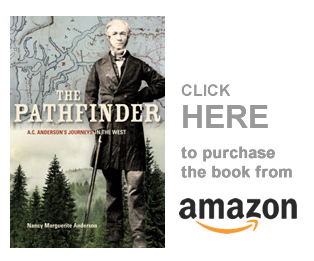 If you want to go back to the beginning of this series, then click here: http://nancymargueriteanderson.com/pathfinder/ and follow the links! Enjoy! My second book — Working Title: York Factory Express — is now in the hands of the editor, and I have begun writing my third. Its Working Title is “Brigades.” Yes, these dogs might be mentioned in it! Copyright, Nancy Marguerite Anderson, 2014. [Updated, August 4, 2015]. All rights reserved.